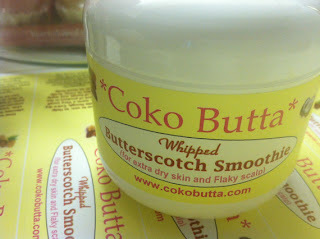 Coko Butta: Whipped Butterscotch Smoothie is a 100% all natural hair & body cream for extra dry skin & flaky scalp. Its retail price is $10.00 for a 4oz jar. This cream is yellow in colour and heavily perfumed. The scent may be too strong for some people, but if you love sweet things tell your sweetheart to get you this! It is not greasy which is great! And soaks in right away. Deep Hydration & Non Greasy: It has a nice rich consistency, leaving your skin feeling moisturized and hydrated. Shelf life: The estimated shelf life is published on the website! Most all natural products do not put an expiration date on their products, but Coko Butta does! We absolutely love this!! Packaging: The ink comes off the label after a few uses. 100% Butyrospermum parkii (Shea) butter, Organic pure pressed coconut oil, Grape seed oil, fragrance oil and organic carrier oils. Whipfinity: is white in colour and has a light creamy consistency. It is a Shea butter based whip for both your hair & skin. 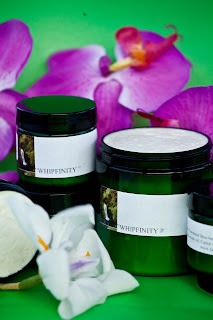 Whipfinity comes unscented, as well as in 5 different scents: Citrus Blossom, Sweet Cinnamon, Relaxing Lavender, Candy Cane (Peppermint), Kingsmen (Frankincense and Myrhh). Hydration: When used as a daily moisturizer, it kept my skin moisturized all day long! Non-greasy: It is light and particularly perfect for summer months. Light scent: It is gently perfumed, pleasant and does not stick around for long. No shelf life on the container: neither the container or label had a shelf life symbol nor expiration date. Also, apart from the Shea butter on the ingredients list, none of the other oils are noted as unrefined. Unrefined Shea butter, Argan oil, Grape seed oil, Coconut oil, Avocado oil, Castor oil, Rosewater, Aloe Vera, Vitamin E, Essential oil. Hand dry hair towel is super soft, super absorbent micro-fibre that instantly absorbs water for a frizz free natural styled look. Hand dry comes as a towel and hair glove! You can get either in a choice of pink or black. Posted by Shakara Natural Tips at 11:04 p.m.
LaWanda S July 11, 2012 at 11:17 p.m.
great review, I would love to try one of those butters. Shakara Natural Tips July 11, 2012 at 11:34 p.m. Unknown July 11, 2012 at 11:23 p.m.
Vee July 11, 2012 at 11:25 p.m. I love this post Yemi! I'm actually working on a review for Whipfinity this very minute...lol. Shakara Natural Tips July 11, 2012 at 11:33 p.m. Thanks Vee! LOL can't wait to read it!! TrueKinks July 11, 2012 at 11:32 p.m. I've never tried any of these products but they seem like they'll work! The hair/body products seem to have very good ingredients and there's a big plus since they can be used for both hair and body! 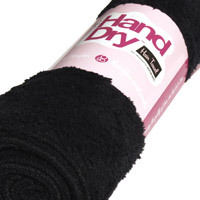 It's good that the hand-dry absorbs quickly, and looks to be very soft on the hair! Great Review! Shakara Natural Tips July 12, 2012 at 12:52 a.m. Thanks TrueKinks! yes they both have great ingredients! Anonymous July 11, 2012 at 11:33 p.m.
Shakara Natural Tips July 12, 2012 at 12:54 a.m.
Aww welcome! there's more coming, stay tuned! Melissa Crawford July 11, 2012 at 11:59 p.m.
Im new to blogging, but I just wanted to say thank you to all the natural hair blogs and fb pages. You guys give ppl like me encouragement that I can maintain my natural hair and feel confident in doing so. Yo guys give use your tips and you don't have to. You help ppl like me that had no clue what i was going to do feel confident in my decision !!!! Thanks Melissa, you made my day!! naturallypisces July 12, 2012 at 12:02 a.m.
Would love to try the microfiber towel!! Shakara Natural Tips July 12, 2012 at 12:55 a.m.
Aisha Johnson July 12, 2012 at 12:07 a.m. I'm currently in the transitional phase in my natural hair journey. While I have been perm free for 2+ years, I am still heavily reliant on heat straightening with blow dryers, hot combs, and flat irons. Weaves are also a regular part of my hair care/styling routine. I have noticed, however, that my hair is thinning from the stress and pulling of my braids and weaves, as well as excessive heat damage. I'm ready for a change but must admit it is terrifying to let go of these crutches. In my mind I often wonder, where do I start?? What should I do? What can I use to make this transition as smooth as possible? This blog is the answer! It is full of a wealth of natural hair care information, styles for the new and seasoned natural beauty, and tons of products made for hair and skin just like mine! This takes away the fear of the unknown and gives me the chance to embrace and be proud of my natural hair journey! Now even I can feel like a professional and do what comes naturally for my naturally growing hair. Can't thank you enough for guiding my steps and keeping me confidant in my naturalness! I'm a Shakara girl for life! Shakara Natural Tips July 12, 2012 at 1:00 a.m.
AWWW you are TOO Kind! Thanks Aisha!!! <3 I'm thinking of doing a full article on transitioning in the next few weeks, because I've gotten so many questions about it recently. here is a response I shared with another lady who is in the process of transitioning hope it helps! Transitioning relaxed hair to natural hair is possible but not easy, because of the very different textures. The easiest method is to big chop, remember hair grows. However, if you decide to transition without a big chop educate yourself about natural hair care first, prepare friends and family of the change, visit natural hair blogs and forums to stay informed. The best transitioning styles are braided/twisted styles, twist-outs, braid-outs, sewn-in-weaves (but remember you still need to look after your hair while it is in a weave). Reduce your use of heat to a minimum to avoid damage/breakage, learn to work with damp hair: water will soften the texture of the new growth. Increase deep conditioning efforts as you progress on your journey ( learn to balance moisture and protein treatments); embrace your curls, and lastly set clear goals. Going natural is in-expensive and freeing! Good-luck!! sulfate free shampoos: Aubrey Organics Egyptian Henna Shine-Enhancing Shampoo, Alba Botanica Daily Shampoo, Anita Grant Babassu Lavender Rose Shampoo & Shower bar, Sheamoisture Raw Shea butter Moisture retention shampoo. Use a moisturizing deep conditioner (at least once a week) and protein based conditioner every 2-6 weeks, or as needed. Good luck! Shakara Natural Tips July 13, 2012 at 12:23 a.m. Please contact me, you won!! Shoiney July 12, 2012 at 12:13 a.m.
Shakara Natural Tips July 12, 2012 at 1:01 a.m. They are both awesome products! Hand Dry is super soft!! Kimberly J. July 12, 2012 at 12:18 a.m.
Shakara Natural Tips July 12, 2012 at 1:03 a.m.
Aisha Johnson July 12, 2012 at 12:19 a.m.
Shakara Natural Tips July 12, 2012 at 1:02 a.m.
You're welcome Aisha! I am truly humbled!! Regina July 12, 2012 at 12:55 a.m. These products sound delicious! I would love to try them. Shakara Natural Tips July 12, 2012 at 1:04 a.m.
Regina July 12, 2012 at 12:57 a.m. The products sound delicious. I would love to try them. Coko Butta July 12, 2012 at 1:35 a.m.
Shakara Natural Tips July 12, 2012 at 1:43 a.m.
Keep up the great work!! Your products ROCK! Jadellsmom July 12, 2012 at 8:56 a.m.
Shakara Natural Tips July 12, 2012 at 11:46 a.m.
AWW Thanks Jadellsmom!! much appreciated! Jadellsmom July 12, 2012 at 9:01 a.m.
Shakara Natural Tips July 12, 2012 at 11:48 a.m. They are all great! I'm glad to have had the opportunity to review them. Check them out and thanks again!! Nicole DeVaughn July 12, 2012 at 12:08 p.m. I love exploring new products...hope I am one of the lucky winner! Your page/blog is one of my favs--I check in with you daily. Thanks for the review & keep doing what you do! Shakara Natural Tips July 12, 2012 at 11:44 p.m.
AWW thanks Nicole!!! much appreciated! Kimberly July 12, 2012 at 12:16 p.m.
All products seem great. I would live to try any if them. I BC'd Feb of this year and still trying to find what's best for my hair. Shakara Natural Tips July 12, 2012 at 11:12 p.m. Yes they are! :) How has the experience being so far? I've found adopting a proper regimen helps with maintaining and increasing length. Good-luck and best wishes! S.
wanda July 12, 2012 at 12:32 p.m.
Shakara Natural Tips July 12, 2012 at 11:13 p.m.
Hey Wanda! They are all awesome it is understandable...Good-luck!! allie July 12, 2012 at 12:35 p.m.
love to try all of the products!! Shakara Natural Tips July 12, 2012 at 11:15 p.m.
Shakara Natural Tips July 13, 2012 at 12:24 a.m.
You won Allie, please contact me! Shakara Natural Tips July 13, 2012 at 12:26 a.m.
wanda July 12, 2012 at 12:36 p.m.
Shakara Natural Tips July 12, 2012 at 11:16 p.m.